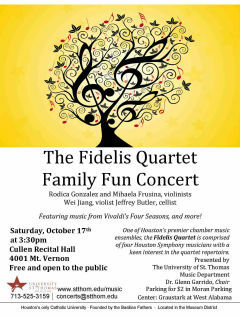 The University of St. Thomas Music Department presents The Fidelis Quartet performing a Family Fun Concert. This performance will feature music from Vivaldi's "Four Seasons" and other classical pieces you are sure to know and love. One of Houston's premier chamber music ensembles, the Fidelis Quartet is comprised of four Houston Symphony musicians with a keen interest in the quartet repertoire. The quartet features Rodica Gonzalez and Mihaela Frusina, violins, Wei Jiang, viola, and Jeffrey Butler, cello.